Gifts need to be as special as the person you want to give it to. This is a perfect gift hamper for your younger ones, you can surprise your yonder one’s on their birthdays by sending then this hamper. This hamper will surely make your special occasion the most memorable one, that your younger ones will treasure for the rest of their lives. This amazing combo contains Delicious cake& 6 Colourful Balloons. 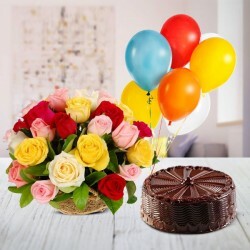 Content: 6 blown Balloons, ½ Kg chocolate cake & 24 mix flowers basket. It’s a perfect gift for your child as it has so many Balloons. Surprise your fiancé with this amazing hamper. Send this hamper to your girlfriend or wife. Diabetic should take distinct care while consuming these cakes. Keep the stem of flowers in basket to keep it fresh for long. Delivered product might vary to some extent from the image shown above.